Fig. 7.1-2. Transverse section of wood of oak (Quercus). 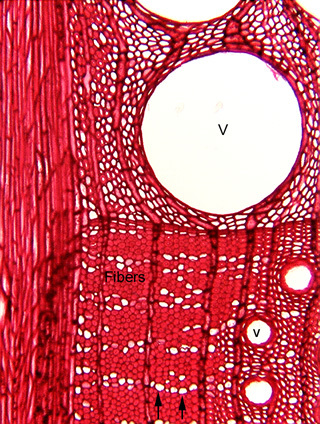 This micrograph is also an introduction to much of the xylem you might see in lab; wood is secondary xylem. The very large white space (V) is the lumen of a vessel element; this single cell has a volume that is thousands of times greater than that of many of the other cells here. Three other, smaller vessel elements (one labeled with v) are also present. The small white dots (two are indicated by arrows at the bottom of the micrograph) may look like very narrow vessel elements are first glance, but they are parenchyma cells in the wood. You cannot tell that from this photograph, but at very high magnification, you would be able to see that they have only a thin primary wall, not a thick secondary wall. All the very dark red small cells are libriform fibers.